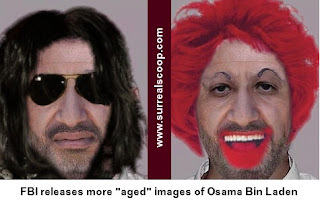 The United States Federal Bureau of Investigations was forced into an embarrassing admission regarding recently released images of Osama Bin Laden aged by a decade. Supposedly processed using sophisticated analytical techniques they had in fact been cut and pasted together from images found on the Internet, including one of a serving Spanish politician. Today the FBI has released further images in the same series in the hope that one of them will assist in the identification of the leader of Al Qaeda, who may be walking among us.